Last week’s visit to the LIC Flea, got me poking around the neighborhood, and I also had the chance to peek into a few places I’ve been meaning to check out. One such eatery is the Cyclo Vietnamese Sandwich and Noodle shop, which boasts popular foods such as banh-mi sandwiches (my fave), pho, noodles salads, as well as clay pot rice dishes. While I saved all the eating for the actual LIC Flea that day, I made sure to grab a menu to entice me for next time. Here’s a peek. 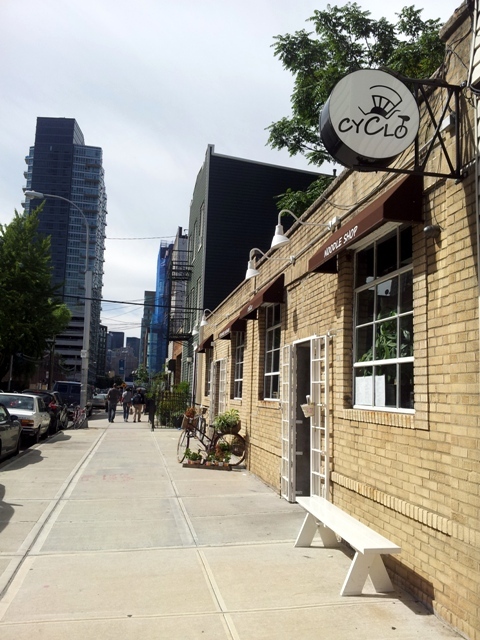 Have you tried Cyclo yet? They also have a lunch special on weekdays from 11:30 a.m. to 3 p.m. during which they serve their regular fare but at lower prices, or sometimes combined with a side such as a salad. I’m totally intrigued and can’t wait to check it out soon!